When planetary scientist H. Jay Melosh attended a meeting between nuclear weapons designers from the United States and the former Soviet Union in May 1995, he was surprised by how eagerly the ex-Cold Warriors sought to work together against an unlikely but dangerous extraterrestrial threat: asteroids on a collision course with Earth. After Edward Teller, father of the American hydrogen bomb, urged others in the session at Lawrence Livermore National Laboratory to consider building and orbiting large, new, nuclear weapons for planetary protection, some top Russian weaponeers in attendance voiced their support. “It was a really bizarre thing to see that these weapons designers were willing to work together—to build the biggest bombs ever,” said Melosh, a geophysicist at Purdue University and expert in space impacts who has an asteroid named after him. Ever since, he has been pushing back against relying on nuclear bombs for the Earth’s defense, arguing that a non-nuclear solution—diverting the trajectory of asteroids by hitting them with battering rams — is both possible and much less dangerous. But Melosh’s campaign suffered a setback last month when the Obama Administration’s new Energy Secretary, Ernest Moniz, signed an agreement with the Russians that the Americans said could open the door to new collaboration between nuclear weapons scientists on asteroid defense. 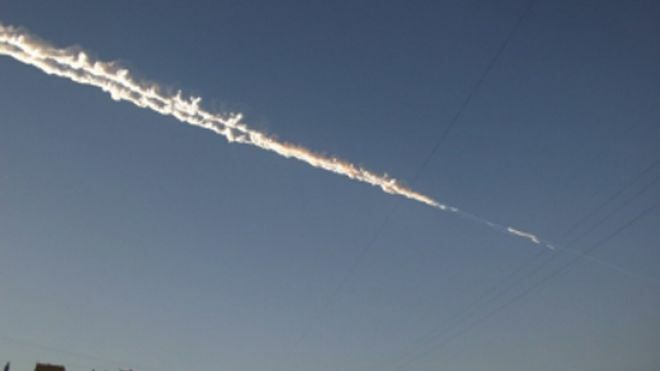 The topic has been particularly interesting to the Russians since an asteroid the size of a tour-bus exploded high in the skies of Russia’s Chelyabinsk region last February. But in recent years, advocates of the use of nuclear weapons to counter space threats have been gaining ground. NASA is spending hundreds of thousands of dollars a year to study the idea, and the U.S. nuclear weapons laboratories are itching to work with the Russians on it. Moreover, weaponeers in both countries are citing the asteroid threat as a reason to hold onto—or to build—very large yield nuclear explosives, which have little terrestrial justification. There are a few impediments, such as the 1967 Outer Space Treaty signed by 129 countries, which prohibits deploying nuclear weapons in space, and other international treaties that bar nuclear weapons testing anywhere, including in space. Many planetary scientists are leery of the idea and some experts worry that radioactive debris from such a nuclear explosion could itself wreak havoc on Earth. But in real life, Bong Wie, the director of Iowa State University’s Asteroid Deflection Research Center, has a three-year, $600,000 grant from the National Aeronautics and Space Administration to design a “hypervelocity nuclear interceptor system,” basically an missile-borne, nuclear explosive fitted with a battering ram. The ram would separate from the bomb before impact, gouging a crater in the asteroid so the bomb could then blast it apart. Wie’s plan is hardly Teller’s grand vision of a space-based nuclear asteroid shield. He proposes using off-the-shelf land-based missiles and explosive warheads currently in the U.S. stockpile to intercept large, city-shattering asteroids that are less than about 10 years from slamming into the Earth, when time is too short to nudge them into a new orbit. These Earth-defending missiles, he said in an interview, could be launched years in advance or even on short warning, although a later defense increases the likelihood that large chunks of radioactive debris will rain onto the planet’s surface. Wie argues that, even in this case, smaller pieces would burn up in the atmosphere and strikes by the remaining rocks would be less damaging than a direct hit by an intact asteroid. The next logical step, Wie says, would be to test his plan by launching a missile and dummy warhead to strike an asteroid, at a cost of around $500 million, to see if his two-stage design could work. But so far this is just a concept. Robert Weaver, a research scientist at Los Alamos National Laboratory where U.S. nuclear weapons are designed, is also among those who have studied the effects of such detonations on asteroids. He used the Energy Department’s “Cielo” supercomputer—which the lab calls its “frontline” computer for simulating nuclear effects. Los Alamos spokesman Fred DeSousa said that Weaver could not discuss his work, and the lab could not provide details of his funding, due to the government shutdown. Another source at the laboratory said a handful of other scientists have also worked part-time in recent years on the problem of Earth-crossing asteroids, including research physicist Cathy Plesko, who has also used computers to model asteroid blasting. Keith Holsapple, an engineering professor at the University of Washington, said NASA has given him a five-year, $1.25 million research grant to study whether an impact device or a nuclear explosion could deflect an Earth-bound asteroid from its path. He and others say studies have shown these are the only two approaches that could work. Holsapple says he is using a device called a gas gun at NASA’s Ames Research Center in California to study the impactor, while separately producing computer simulations of a nuclear blast, employing software originally developed for the nation’s weapons program. The leading proponent of the nuclear solution is David S.P. Dearborn, a research physicist and nuclear weapons designer at Lawrence Livermore National Laboratory in California, presently engaged in refurbishment of the U.S. W-87 warhead—a weapon with an explosive force estimated at more than 375 kilotons, or 29 times the power of the bomb that flattened Hiroshima(it has about a third of the explosive power of the largest bomb in the U.S. arsenal). Dearborn said he was inspired to study the nuclear option a decade or so ago when he heard other researchers tell the media that nuclear weapons wouldn’t work against asteroids. “That’s just not true,” he said in an interview, saying he was offended by their “indefensible” claims. Until two years ago, Dearborn worked on the problem on his own time. But since 2012 he said he and a colleague have had a small Livermore discretionary grant, amounting to perhaps several hundred thousand dollars, for their work on asteroids. He estimated that about a dozen scientists at the weapons labs have worked on the problem, but none is dedicated to it full time. Nuclear explosives could work in two scenarios, he said. Where adequate time exists to divert the oncoming boulder, meaning a decade or longer, a “standoff” nuclear blast could knock it off course. When the time to impact is just a few years, he says, it would be too late for deflection but a carefully executed nuke strike would prevent most damage. “You fragment it with enough force so that the pieces spread out ... [and most] miss the Earth,” he said. Small bits of rock would burn up in the atmosphere, or fall as dust. “Fragmentation may reduce a catastrophe to an inconvenience,” he said in a lecture he gave to high school students at Lawrence Livermore, a video of which was posted on the web in 2010. Dearborn says there is that no need to develop new weapons and therefore no testing would be required. “The current, existing devices that we have provide all of the energy that is necessary,” he said. But he acknowledged that a large asteroid close to hitting Earth would probably require a weapon with the yield of about a megaton, one million tons of TNT, roughly the largest in the current U.S. arsenal. Teller’s vision of placing these devices in orbit would not be practical, he said, because they would require periodic maintenance and would have to constantly shuttle between Earth and Space. He said major uncertainties remain, because some asteroids are like solid rocks, others like a handful of pebbles held together by gravity, and still others are porous like pumice. Different materials would react differently to being hit with either a nuclear explosive or an impactor—a crucial issue, because if one broke up in large pieces and remained on a dangerous path, the Earth could still get pummeled. Melosh and Dearborn disagree, with Melosh asserting that since no large, Earth-killing, near-term threats are on the horizon, “the remaining smaller objects can be dealt with by non-nuclear means, kinetic detection being the most straightforward” and technically advanced. “I think that the need for deflecting very large objects that might require nuclear detonations is waning and that a reevaluation of realistic needs is very much in order,” Melosh said. Dearborn says however that he understands the issues better than others because he is privy to classified data. “A truly accurate understanding … of the impulse caused by a standoff nuclear explosion depends on having access to information that is available only to the nuclear laboratories,” he wrote in an email. Dearborn said he is eager to compare notes on the issue with his Russian counterparts. “The Russians that I have met at conferences have certainly strongly considered nuclear a likely option,” he said. During the Cold War, nuclear weapons scientists on both sides dreamed up many civilian uses for nuclear explosives, including mining, harbor dredging and even for oil and gas extraction—like fracking on steroids. But after the demise of the Soviet Union, almost all of these schemes fell out of favor, with the singular exception of defending Earth with a nuclear shield. Hugh Gusterson, a Stanford-trained anthropologist who wrote a 1998 book about Lawrence Livermore titled “Nuclear Rites: A Weapons Laboratory at the End of the Cold War,” said in an interview that weapons designers in both the U.S. and Russia first began talking about a nuclear defense against asteroids as the decades-long standoff between superpowers ended. In Gusterson’s view, the timing was not coincidental. The weaponeers, he said, were searching for new ways to use their highly-specialized skills and the labs needed a new mission. “It was a response to the loss of the weapons lab mission, it was not a response to the asteroid threat,” Gusterson said. After the U.S. labs found work maintaining the nation’s nuclear weapons stockpile without testing, he said, “interest in asteroids faded into the background” in this country. Oddly, the actual 47-page U.S.-Russian agreement—which the Energy Department has not publicly released but which the Center for Public Integrity obtained—does not mention asteroids. Instead it calls for the two countries to use the “experience and expertise gained by organizations of the respective nuclear weapons complexes,” and lays out broad areas for potential cooperation on civilian nuclear power, nuclear nonproliferation, fusion power research and the development of new nuclear security and safety technologies. It also lists a host of highly sensitive sites where joint research can occur. U.S. scientists can propose work on high-energy lasers and plutonium-fueled breeder reactors, for example, some of it at Russia’s main weapons design centers in Sarov and Snezhinsk. Russian scientists, meanwhile, can propose joint projects using Livermore’s Vulcan supercomputer, one of the world’s ten fastest, or at Los Alamos’ Dual-Axis Radiographic Hydrodynamic Test facility, which makes x-ray pictures of materials imploding at speeds above 10,000 mph—speeds at which the cores of warheads smashed together to cause a nuclear blast. In response to questions from the Center for Public Integrity, the Energy Department said in a statement that specific projects are to be agreed in talks between labs as well as in the White House’s U.S.-Russia Joint Working Group on Nuclear Energy and Nuclear Security, one of 19 bilateral panels set up several years ago by the administration as part of its “reset” of relations with Russia. A Rosatom statement said specific research proposals would be agreed by the end of the year. The Department of Energy has not disclosed the panel’s full membership but its co-chairs are Rosatom’s Kirienko and Deputy Secretary of Energy Daniel Poneman. During its first meeting in Sept. 2009, the group visited the government site in Oak Ridge, Tenn., where scientists work with uranium weapons components and conduct other nuclear research. “We are making the implementation of the agreement a priority and will be reviewing possible projects soon,” Energy department spokeswoman Keri Fulton said in an email, after declining to address the press release’s mention of asteroid defense. The Russians will likely eagerly embrace the opportunity to work with the U.S. nuclear labs on planetary defense. Oleg Shubin, a Russian weapons scientist who is now Rosatom’s deputy director for the development of nuclear weapons, was among those who attended Teller’s 1995 “Planetary Defense” asteroid conference, according to the official proceedings. Shubin co-authored several of the Russian papers exploring the nuclear option presented at the conference. The state-owned Russian news service RIA Novosti reported March 25 that some Russian officials are weighing the use of nuclear weapons to counter the asteroid threat. “In the opinion of Oleg Shubin, a departmental director at Rosatom, nonnuclear ways of deflecting and destroying Earth-bound asteroids may be exotic but ineffective,” the Novosti article said. The state-supported Russian news channel RT, aimed at foreign, English-speaking audiences, reported a month earlier that Russia’s Academy of Sciences had given Russian deputy prime minister Dmitry Rogozin a plan for spending $2 billion to bolster an asteroid defense program. According to a separate article by the Interfax news service, Shubin warned members of Russia’s Federation Council, the upper chamber of parliament, at a March 12 roundtable on planetary defense that the world could find itself with less than a year to prepare for a large asteroid strike. “It will take a nuclear device much bigger than one megaton to intercept an asteroid of more than one kilometer in diameter,” he told the roundtable, according to Interfax. “This scientific and technological task has a solution in principle,” he said, apparently referring to building a bigger warhead. So why exactly did asteroid defense appear in the U.S. press release given out by Moniz? Fulton declined to say. But according to a former DOE official who stays in close touch with the agency, an important proponent for new, joint work on the asteroid threat between U.S. and Russian nuclear weapons scientists was Donald L. Cook, deputy administrator at the Energy Department’s National Nuclear Security Administration, where he oversees the nation’s weapons labs. Cook served for three years as the chief executive of Britain’s Atomic Weapons Establishment before joining the Energy Department in 2009. Earlier, he was an administrator at Sandia National Laboratories in New Mexico, which makes the nonnuclear components for nuclear weapons. Fulton said she could neither confirm nor deny his role in the deliberations. No one disputes that the threat posed to Earth by large rocks is real. Scientists first recognized this in the 20th century, when they concluded that many large craters—and geologic features like the Chesapeake Bay and Hudson Bay—were not the result of volcanic or other planetary forces but had been formed in part by the past impacts of mammoth asteroids. A major U.S.-led effort to detect Earth-bound asteroids began in 1995, and NASA says astronomers so far have detected 10,200 with orbits that bring them close to Earth, including about 859 believed to be boulders at least six-tenths of a mile long—longer than two Queen Elizabeth-sized ships docked stem to stern. The largest of these, which might strike only once every 700,000 to 100 million years, could threaten civilization. A blast caused by a six-mile-wide asteroid that slammed into a spot near the Yucatan Peninsula is thought to have wiped out the dinosaurs and most other animals 65 million years ago. But even smaller rocks—between 460 and 3,170 feet wide—can flatten cities or wreak havoc. The 60-foot asteroid that exploded over Chelyabinsk had the power of half a megaton of TNT, damaging 4,000 buildings and injuring at least a thousand people, Russian officials said. Objects this large slam into the Earth on average about once every 100 years. Impacts involving asteroids as tall as water towers occur once every 2,000 years or so, and would have a force of ten megatons. Rocks the length of naval destroyers, or about 460 feet, would land with 300 megatons of force, but these hit only about every 30,000 years. Fortunately, none of the 859 interplanetary monsters spotted so far appears to be headed for collision with Earth, at least for the next hundred years; the timing of their orbital crossings do not coincide. But astronomers estimate there may be 20,000 smaller but still potentially destructive asteroids whizzing around out there, waiting to be detected. The report said called for more scrutiny of the sky and said the nuclear option would be “a last resort,” but also said it was most powerful approach and the only one that could be used against very large objects—those a third of a mile across or larger—spotted less than a decade before they might hit. “Nuclear explosives constitute a mature technology, with well-characterized outputs,” the report said. “They represent by far the most mass-efficient method of energy transport and should be considered as an option for NEO [Near-Earth Object, i.e. asteroid] mitigation.” But the report also supported Melosh’s approach, ramming an asteroid with a heavy object. Livermore’s Dearborn was a member of the panel, as was Mark Boslaugh of Sandia, who has also modeled the effects of nuclear blasts on asteroids. Many of the other members were from academic institutions, but several represented private firms with a financial stake in space research, such as Ball Aerospace & Technologies Corp., Orbital Sciences and Belton Space Exploration Initiatives LLC. The Center for Public Integrity reported in February that Ball Aerospace in 2008 lobbied on a section of the NASA budget that directed the agency to continue efforts to “detect, track, catalogue and characterize near-Earth asteroids and comets in order to provide warning and mitigation of the potential hazard of such near-Earth objects to the Earth,” according to Senate records. Melosh also served on the National Research Council panel, but says he disagreed with some of the report’s conclusions. He was the co-investigator on a 2005 NASA mission known as Deep Impact that launched an 820-pound copper-covered battering ram that gouged a crater out of the comet Tempel 1 in 2005, and measured its effect. He says the same basic approach could be used with asteroids that threaten Earth. And he says the nuclear option would not work with existing weapons, but only with new, even larger nuclear explosives than exist in any arsenal. Melosh said panelists were limited under the terms of the National Research Council study to suggesting approaches that could be used in the next twenty years – giving the nuclear option an advantage, because a stockpile of weapons is already available. “I think in the long term there are much more effective efforts,” he said. Besides Melosh’s battering ram idea, scientists have suggested such non-nuclear options as using ion engines, which rely on atomic particles for propellant, to tug threatening rocks slowly into a new orbit. Some have said that flying a heavy spacecraft alongside an asteroid could also deflect it. Both approaches would need decades to budge a big rock. A team of scientists including University of California physicist Philip Lubin has also proposed building a six-mile-wide array of solar-powered lasers to vaporize asteroids. All these approaches are considered decades away from being ready for use. But in April, the White House budget asked Congress to approve $105 million in seed money for a robotic NASA mission to capture an asteroid in a big bag and drag it to an Earth orbit, so its composition can be studied by astronauts. One aim of this $2.5 billion project, the agency said, would be to figure out how to capture large, rogue, space objects. But the House Committee on Science, Space and Technology voted in July on a NASA authorization bill barring the agency from proceeding. Its report called NASA’s request “premature,” saying the agency needs first to complete concept studies, line up international partners and muster more scientific support. In all, according to the 2010 National Research Council report, the U.S. government long spent less than $5 million a year on asteroid defense programs, a rounding error for many federal programs. About $4 million of that went to detection and tracking. But NASA has awarded at least $878,000 in the past two years to researchers working on so called “mitigation” strategies, methods of deflecting Earth-threatening asteroids, according to the government grant database usa.gov. Christopher Chyba, a Princeton arms control and nonproliferation expert who sits on President Obama’s Council of Advisors on Science and Technology, an 18-member panel of academic and industry experts who make science policy recommendations to the White House, said that if the U.S. and other nations work hard to identify all the large asteroids that cross Earth’s path, the world will have decades of warning time in nearly every case. That will allow scientists to develop and deploy a non-nuclear response. Chyba said both the U.S. and Russia were committed to various arms control treaties that ban the testing of nuclear weapons and their use in space. “Nobody’s talking about testing,” he said. But Chyba emphasized that a joint U.S.-Russian asteroid defense program would be important simply because the threat is real. “This is a hazard I take seriously, and I think this civilization needs to take it seriously,” he said. Jeffrey Lewis, a nonproliferation expert at the Monterey Institute for International Studies, said however that the new U.S.-Russian agreement is troublesome because relying on nuclear weapons to stop the “hypothetical threat” of a large asteroid strike risks weakening the test ban and outer space agreements. David Wright, co-director of the Union of Concerned Scientists’ Global Security Program, expressed similar reservations about the potential involvement of the U.S. and Russian weapons labs, saying he hoped it would not become a “jobs program” for weapons scientists. Whatever the solution, Melosh says, the human race has the time to pursue safer alternatives. “A lot more people have been recorded to have died from nuclear weapons than have been recorded to have died from asteroid impacts,” he says. The Center for Public Integrity is an independent, nonprofit investigative news organization.